"It is spotless and the breakfasts were wonderful." "They had me at doily-free B+B!" "You guys have a really good thing going here...."
"You could smell how clean the sheets and towels were. Comfy bed and great snacks left out. Melinda and David were so helpful with where to go and what to see. Awesome breakfast in the morning and had fun getting to know the other guests over coffee." "The rooms were immaculate...and nicely appointed. We wanted for nothing. Breakfast was hearty and delicious." "From the moment we walked in it felt like we were home." "The hosts are friendly and gave us good recommendations for things to do.… Perhaps the best b&b we have stayed at." "The gourmet breakfasts are scrumptious and plentiful and the coffee is amazing. It is just steps from the bay and an easy walk to town. I will definitely be coming back often." "We have always stayed at B&Bs across Europe but never in the US. Coming here made it feel lke we were travelling abroad again. The small comforts provided made it feel like we were also visiting old friends. Thank you so much for helping to 'take us so far from home' while staying right here in Michigan." "Hospitality clearly comes naturally to Melinda and David, as they effortlessly make you feel at home." "The hosts were thoughtful and engaging conversationalists, adding to the enjoyment of the excellent breakfasts. We hope to make the Aberdeen Stone Cottage our home base on our next visit." "We have always been delighted with the friendly, helpful owners and their excellent breakfast cuisine. The location is perfect as you can walk to the downtown, the beach...."
"The whole experience was amazing. 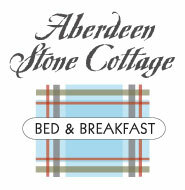 We will definitely come back and stay at the Aberdeen Stone Cottage again." "Such a wonderfully warm welcome, comfortable room, & delicious breakfast. Such a pity we could not stay longer. Thank you David & Melinda!" "The home is in a neighborhood with old trees, pretty houses, and is close to the beach. I would recommend it to any traveler who likes a personal touch." See more guest reviews on Trip Advisor, Yelp, Booking.com and Expedia. And find us on Facebook and Instagram!